Last month, we made an announcement that NATS has partnered with NAV CANADA for an equal shareholding in the Canadian firm, Searidge Technologies. This is an exciting step for both NATS and Searidge as the complementary strengths of market leading digital ‘smart’ tower solutions, combined with NATS well established capabilities in Human Factors, Safety Assurance, Training, Operational Transition and Regulatory Approval in high intensity hub airports provides customers with a unique offering, with a market leading position in busy international airports such as Dubai and Paris Charles de Gaulle. Searidge smart tower solutions provide an accurate, real-time understanding of the ground situation and the airspace around the airport by extending the controller’s visibility to desired areas of interest, and displaying information in an intuitive way. Their smart tower solutions are based upon the most sophisticated software platform currently available. For example, the Enhanced Airport Vision Display, which has been in operational use for 10 years is in continual development at major hub airports worldwide. This means it is proven in enabling integration of multiple data sources, including various ATMS, A-SMGCS and optical sensors, and supports video analytics to enhance controller situational awareness and reduce their workload – the key to system acceptance by ATCOs. In addition, Searidge’s proprietary ‘True-Stitch’ algorithm, which is the most technologically-advanced video stitching system on the market, consolidates multiple sources of real-time information into a single uninterrupted panorama display that creates an enhanced out-the-window view and which can be displayed on any single or multiple screen display within an airport’s smart tower facility. This design allows users to fully customize the data and graphical user interface to their requirements. True-Stitch is utilised in Searidge’s Final Approach Monitoring System, in use at a number of hub airports including Dubai, to provide a full view of the approach, which is capable of simultaneous display and tracking of multiple aircraft from distances of 12nm to touchdown. Searidge has already achieved significant success internationally with its smart tower technology. In this issue of Airmail, we bring you a case study on Searidge’s partnership with HungaroControl to put in place a digital smart tower at Budapest’s Liszt Ferenc International hub airport. HungaroControl, which provides air navigation services at Budapest Airport and to the wider Hungarian airspace, and (on a NATO assignment) the upper airspace over Kosovo, also trains air traffic control personnel and conducts air navigation services research and development. With air traffic levels forecasted to double by 2020, HungaroControl looked to Searidge for digital tower services that can help them manage the increase in air traffic and address the associated challenges. 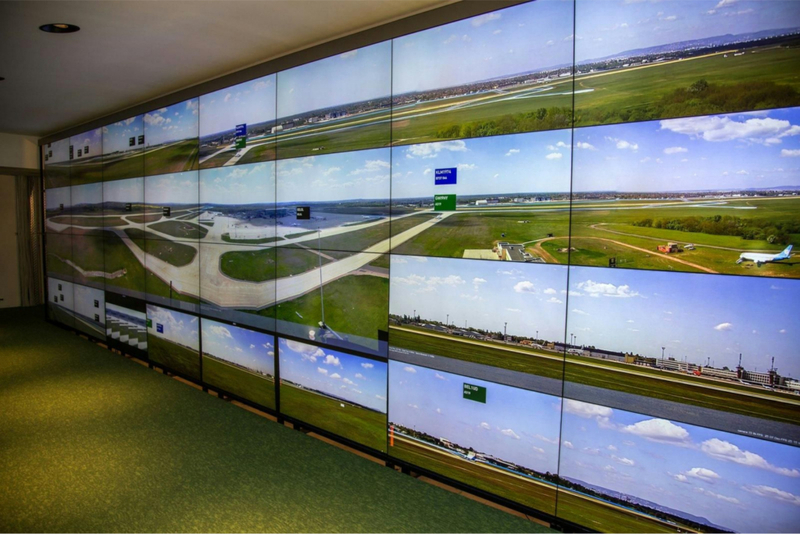 The Searidge digital tower solution was implemented in a medium-sized airport environment, providing controllers with a live, panoramic stitched view of two runways and the apron area at Budapest Airport. The air traffic control information was presented on a customized video wall that incorporated a fully tailored human machine interface. The system also provided an OTW (out-the-window) view presentation and binocular control replacement to enable ATCOs to meet ICAO Doc 4444 requirements and to achieve regulatory approval for visual surveillance. Implemented with the user in mind, HungaroControl’s ATCOs who used Searidge’s digital tower solution found that their workload did not change significantly as a result of the new equipment. In fact, the ATCOs found that the new functions of the controller working positions provided useful and reliable information and control options, allowing them to handle peak hour traffic effectively from the digital ‘smart’ tower facility. The system’s ease of use meant that user adoption was accelerated. The Searidge digital tower solution, which went live in mid-2016, achieved 125 hours in live trials- managing almost 600 movements; in addition to 405 hours in passive shadow mode. The goal is to have the system certified to provide full contingency ATC facilities by late 2017 with the intent to transition to full primary operations in 2018. For more information about Searidge and its technologies, please visit https://searidgetech.com/.